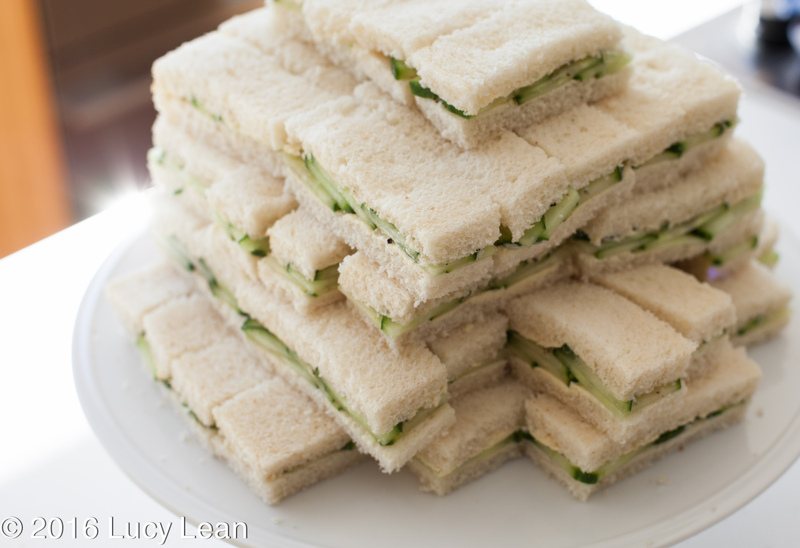 Bring on the British manners and the symbol of the upper class with the delicate deliciousness of a cucumber sandwich. A staple of tea parties on the rolling lawns of a stately home on that rare summer’s day it has been what I’ve been craving post Thanksgiving and pre-Christmas. Perhaps it’s the simplicity of the cool cucumber filling accompanied with salt and pepper, butter and crustless white bread. Or perhaps it’s the perfect antidote to the heavier scone, cream and jam that I’m also partial to, regardless of the season. 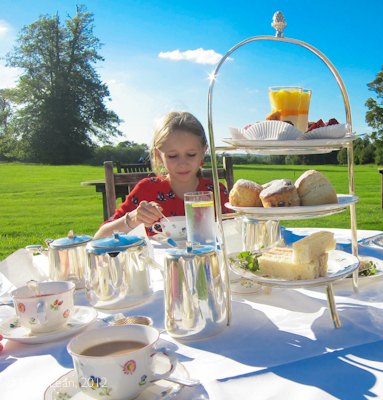 When we go to England we make a point of having tea – favorites are the cream tea at the Dean Street Townhouse and also at Lucknam Park, near Bath, eaten out on the lawn under blue skies. In London are all big fans of tea at the Wolseley with my Great Aunt Lady Lean – and many plates of finger sandwiches, including cucumber, are always ordered. .
During Gwendolyn and Cecily’s teatime fight – played out in what they want to eat – cake or bread and butter – the young ladies try to get the better of each other using teatime food. When Gwendolyn says that cake is rarely seen at the best houses these days Cecily cuts her a large piece of cake and asks Merriman to hands it over on the pretty plate. 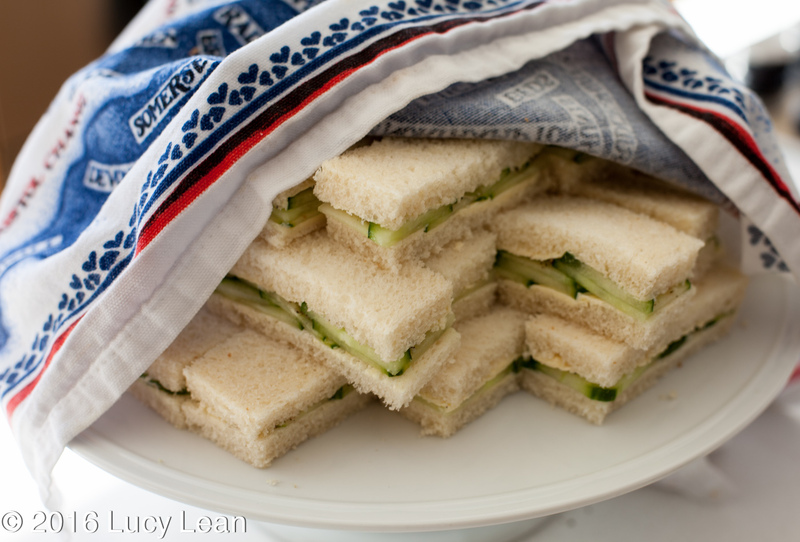 When making something as simple as a cucumber sandwich it’s super important to get the ingredients right – soft white sliced bread, a hot house cucumber, the best butter, a little salt and freshly milled black pepper to season. I’m not a fan of the American cream cheese in cucumber sandwiches and I don’t peel the cucumber as I like the green. 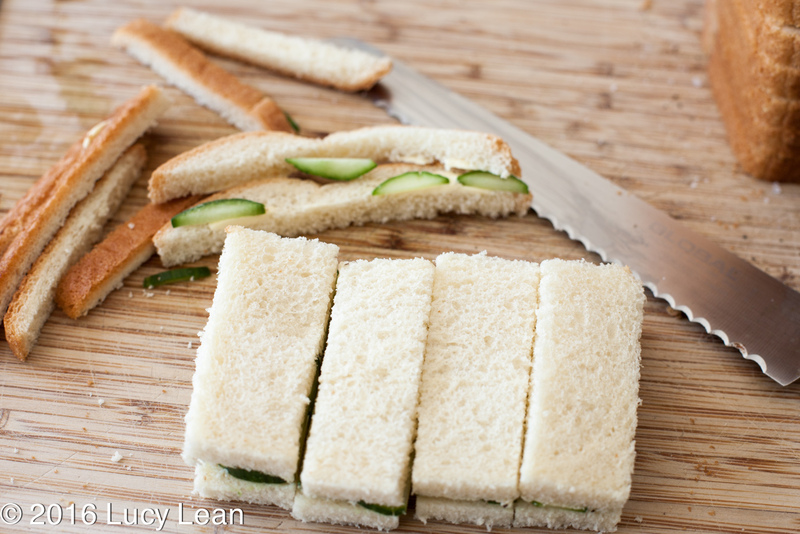 I prefer to cut the sandwiches into finger sandwiches rather than triangles (less wastage). Perhaps the biggest challenge is keeping them soft – the bread tends to dry out and get ‘stale’ if left out in the air for even a few minutes. The key to success is to take a tea towel and wet it under a cold tap. 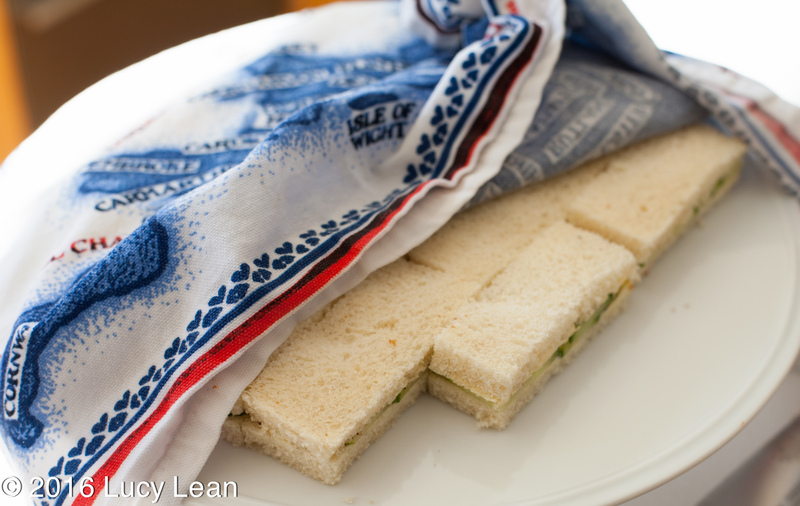 Squeeze out all the excess water and then use this damp towel to cover the sandwiches as you make them. Once the platter is filled cover with plastic wrap and refrigerate until needed. 1. 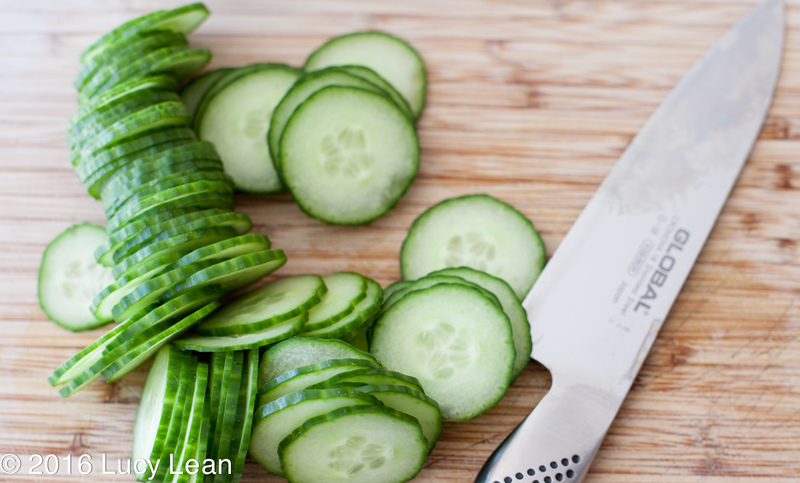 Using a sharp knife carefully slice the cucumber into fine slices. 2. 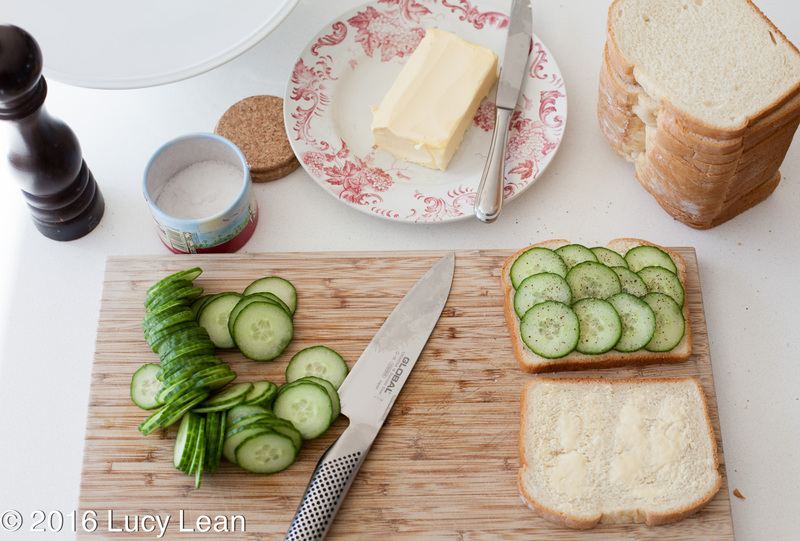 Work through the loaf of bread, lightly buttering two slices, covering one slice with layers of cucumber slices and seasoning with salt and pepper. Sandwich the two sides together. 3. 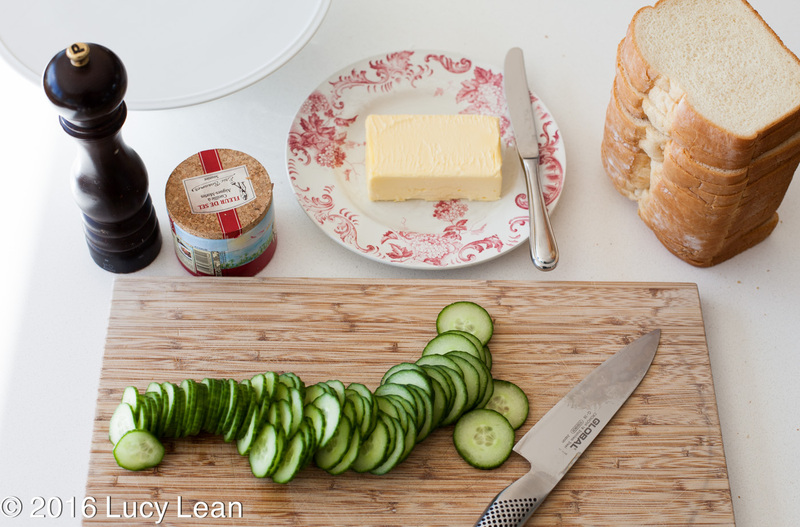 With a bread knife carefully remove the crusts from the outside of each sandwich and cut in half and then in quarters to form four finger sandwiches. 4. Arrange the finger sandwiches on a platter or cake stand. Cover with a damp tea-towel as you carry on making each sandwich. 5. Cover with plastic wrap and refrigerate until tea-time.